70 years old and still going strong! 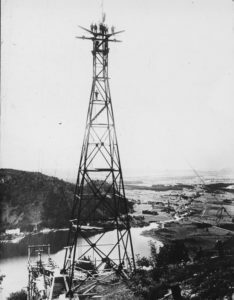 In 1927 a cable car was built on the Kanzelhohe, near Villach in Austria; Health & Safety was clearly not an issue! But, what has this got to do with AWSA 70? On 8th May 1945, one day after the end of the War in Europe, the British 8th Army commanded by Lt Gen Sir Richard McCreery (late 12th Lancers) moved from Italy into Austria. As “British Troops Austria” (BTA) some 55,000 soldiers lived in the British Zone as part of the Allied occupation. As the devil finds work for idle hands, McCreery tasked one of his staff officers, Lt Col Robert Readhead 12L, to get as many as possible to learn to ski. Readhead had competed at the last FIS World Championships in Zakopane POL in 1939 and taught British soldiers to ski in France, Norway, Lebanon and Scotland during the War. With Friedl Wolfgang, a guru in alpine skiing, who later was the Sec Gen of the 1964 Innsbruck Olympic Winter Games, he recruited 600 Austrian ski instructors. A Mountain School was established on the Gross Glockner for climbing and winter warfare courses. In 1946 troops from BAOR and the Central Mediterranean Forces held a Championships in Italy at Cortina, whilst the BTA did likewise on the Kanzelhohe; this was the first time many competitors had ever seen a cable car, never mind travelled in one. 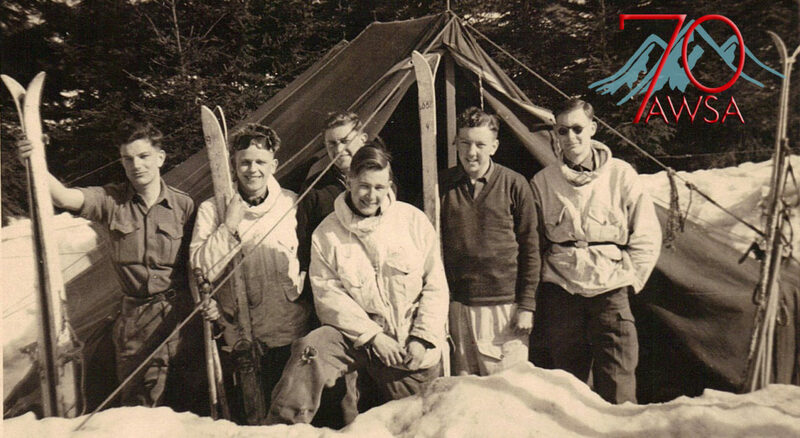 On 22nd May 1947, at the behest of the CIGS Field Marshal Montgomery, the Army “Skiing” Association (ASA) was formed with Maj Gen JET Younger (late RA) as Chairman; “Skiing” changed to “Ski” in 1949. Monty was a keen alpine skier and became the Vice Patron. The first “Army Championships” on the Kanzelhohe in 1948 included Alpine & Nordic, with 1 West Yorks being the winners of both. The Clerk of the Course was Maj George Moore APTC who fenced for GBR in the 1948 London Games. His son, John ”JAG” later a Lt Col RA competed in the 1956, 60 & 64 Winter Olympics; his grandson Mark (Capt RA) competed in Sarajevo 84. John Moore sadly died in August 2017. The Chief Timekeeper was SSI (later Col) Jimmie Spencer, who fought, as a Bombardier, with the 8th Army at Monte Cassino. He competed in the 1956 Winter Olympics. Jimmie now lives in Canada and is the Army’s oldest living Olympian. But 1948 was not the true start of competitive winter sports in the Army! The first recorded race was in 1767, between Norwegian and Swedish border patrol units. In 1908 the first International Military Patrol race took place, and then appeared in every Olympic Winter Games from 1924-48, before emerging as Biathlon from 1960 onwards. Individual British officers had taken up the new sport of skiing with enthusiasm, some in cross-country touring and racing, and others in downhill running and racing. In 1888 Col Napier brought skis to Davos, and the next year Sir Arthur Conan Doyle, author of Sherlock Holmes, began to ski there. In 1903 the Ski Club of Great Britain was founded. In 1908 a number of Army officers took part in founding the Alpine Ski Club. In 1914 Sir Henry Lunn presented what became the Army, Navy and Air Force Cup for the British Services Champion. As the Inter Service Alpine Championships this is oldest still- running event in world skiing. In 1949 the Championships moved to St. Anton am Arlberg in the French Zone. It was home to the legendary Arlberg-Kandahar races first organised by Schneider and Sir Arnold Lunn in 1928, which were the pre-cursor to the introduction of alpine racing in the 1931 FIS World Champs. 1950 saw a move to the US Zone and Bad Gastein, it hosted Biathlon World Cups in 1993 & 1994 but as part of the vast Ski Amadé network is better known for alpine & snowboard as well as the amazing “Flying Waters” zip line. On 12th May 1955 Austria once again became a sovereign and independent country and within 5 months all the Allied forces had moved out; so had Nordic (Ex Rucksack). Although Army Alpine was to remain at Bad Gastein for another 4 years, Nordic moved to the German health spa of Winterberg. With many of the 77,000 strong British Army of the Rhine (BAOR) living within a couple of hours, it was little surprise that the former Kurhaus became the sixth of the seven “Naafi Leave Centres” set up in Germany. Winterberg is perhaps better known now for its iconic ski- jump and “VELTINS Eis-Arena”, having hosted the World Bobsleigh Champs on 4 occasions, as well as the Army Championships. 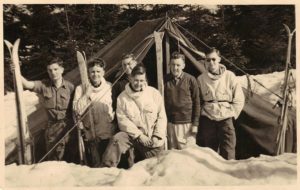 One person who may not have taken it totally to heart is former National Serviceman Bdr Bryant G Bayliffe 115 Loc Bty – second from left, with skis that were made for the Norwegian Campaign in 1940. At 85 years old he clearly recalls digging in 3 feet of snow at the rear of the Centre to erect the tents. “I have no idea where the officers stayed – but it is not too difficult to work out!” he said. Since 1947 the ASA / AWSA has occupied more than half a dozen different offices which it has almost always shared with the Army Sport Control Board and has had 13 Secretaries. In the early days it, rather than the disciplines themselves, organised all the Championships including grappling with the oddities of transporting all the UK based competitors by train from Liverpool Street to Austria (£12.50 for officers; £10.50 for other ranks). In 1954 at Bad Gastein it cost officers £37 for the 8 days including travel & ski lifts but only £21 for ORs as 34 of their ration allowance was retained by the Army! Female competitors have always been included, except for Cresta, with Cdr Macfie winning the first ever Ladies Alpine Championship and later becoming the first female Honorary Member. It was responsible for running ski holidays before the advent of package holidays and in its heyday in the mid-60s, had a membership of 14,000; today it is a tenth of that. It published a Year Book (now Snow & Ice), which as recently as 1989 had full page adverts for cigarettes! In 1963 Nordic moved to Oberjoch, in Bavaria. It stayed until 1979 – the 2nd most visited of the ten Rucksack venues. Higher and with a better snow record than Winterberg, the main reason for the move was the arrival of biathlon. There was simply not enough real- estate in Winterberg to allow the RE troop to build the 2 ranges (full-bore at 300m & 150m) required in the early days of the sport. Before modern targets the Sappers were constantly experimenting with paper, clays and, helium balloons. It would take hours to check all the targets and produce the scores, but by 1978 the .22 small bore rifle and reliable mechanical and electronic targets were in use. Oberjoch in 1963 was very much an alpine resort; for some years the BAOR Alpine Champs were held there and later also the 2 Inf Div Alpine & Nordic. Thus, each winter, the Allgau, which was also home to Ex Snow Queen when up to 10,000 soldiers went on a 10-day ski course, was almost an extension of BAOR. Indeed the Rucksack Prize Giving was a lengthy high profile military and diplomatic event with Military Bands and a lot of ceremonial, as well as every senior officer in Germany seemingly present. Zweisel … did it ever snow? Zwiesel in the Bayerischer Wald National Park, some 200 miles north east of Oberjoch was the venue for Rucksack from 1980 – 1992. The topography and location, right on the edge of the communist Czech border (complete with barbed wire & mine fields) was different to anything used before – or since. As a town it was particularly famous for Bärwurz, a uniquely flavoured liqueur, which makes “vodka Red Bull” taste like a soft drink! Suffice to say that during the 13 years in Zwiesel much time was spent drinking Bärwurz in the Colosseum Disco or the alternative Race Office – the Hotel Kapfhammer! 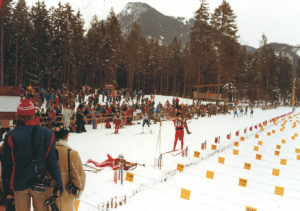 But much time was also spent competing on one of the 4 locations used for races: Innenreid, where most Cross Country took place a mere snowball’s throw from the team accommodation in the Holiday Village; Regen at the German Army Barracks for some biathlon; The Arber where the Hohenzollern biathlon range was built during our time and where an IBU Cup is now regularly held, and the Grosser Arber which was a NATO listening post during the Cold War for many Patrol Races. 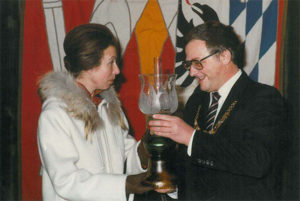 The snow was often “unpredictable” but not when BOA President HRH Princess Anne visited in 1985, (pictured with 1st Bürgermeister Georg Haberland). This was not the case in 1990 when the Patrol Race range had to re-locate to a quarry just 51m deep with just enough snow for athletes to cross-fire, over and above each other. It was also memorable as the year when the Czech Border opened with some 30,000 crossing from one country to another (and back) in one day – just for the historic hell of it! The 1992 OWG, master-minded by the legendary Jean-Claude Killy were held in Albertville, but the discipline venues were spread around the French Savoie. 30 km away Les Saisies hosted Cross Country & Biathlon and Sgt Mike Dixon RE finished a GBR best ever 12th in the 20 km (0-0-0-0), albeit SSgt Keith Oliver RCT was 11th in the full-bore race in 1972. The GBR manager was a young Capt Eddy Lowe RE, the Rucksack TD to this day! In 1988 the ASA had become the AWSA after Cresta joined in 1955; Bobsleigh 1966; Ski Bike 1971; Luge 1987 and Skeleton 1989. Ski Bike left the fray in 2002 but Snowboard joined in 1997 and Telemark in 2009. The budgeteers and some senior officers thus assumed that co-location of events, especially Alpine & Nordic, would lead to a reduction of costs and officials. They were wrong on both counts! Moving Nordic from Germany saw a loss of NATO tax-free status and, it takes almost as many officials to run a race with 15 or with 150 athletes. “Near-location” was the solution, with Nordic at Les Saisies and Alpine some 3 hours south in Serre Chevalier. However this did mean both disciplines were honoured with a visit from the AWSA Patron HRH The Duke of Kent. 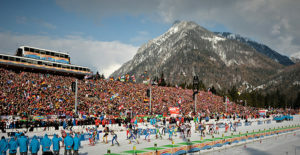 The ice sports and newer disciplines have since competed in locations as widely spread as Lillehammer, Rauris, Cesana and Pralognan La Vanoise. to Les Saisies where the RAC Champs had just been held. AWSA 50 was held in the magnificent surroundings of St. Moritz. At 1800m and with over 300 days of sunshine it is arguably the world #1 winter sports resort. Over 450 competitors from all disciplines (there was no space on the ice for Luge which was held at Igls), made AWSA 50 one of the largest multi- disciplined events outside the Winter Olympics. There were 35 different events plus the Inter Service Alpine & Bob, and a social event almost nightly. 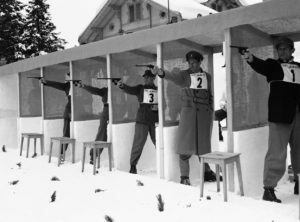 St. Moritz hosted the OWG in 1928 & 48 when “Winter Pentathlon” (Alpine, Cross Country, Equestrian, Fencing & Shooting) was a demonstration sport, just as Snowboard & Telemark were at AWSA 50. The photo shows Capt John Walker. HRH The Duke of Kent & Princess Alexandra visited AWSA 50 and also attended the English Church to mark their 125 years and our 50. It was standing room only; soldiers had to be turned away at the door – amazing but true! Also amazing were the VIPs, from Roger Moore to a total of 47 “stars” of retired & serving senior officers, to former Army Olympians including Lord Glentoran who as Capt Robin Dixon Gren Gds won Gold in the 1964 Innsbruck OWG bobsleigh. Much more went on during AWSA 50 including the World Bob Champs and on the frozen lake Polo, Horse Racing and Cricket (with the Army Team competing). The floodlit Closing Ceremony was also on the lake with medallists arriving by horse drawn sleigh, the RTR Band, Pipes & Drums and Swiss Army Band performed at -18C and memorable fireworks budgeted at SFr 10,000 cost £10,000. As their Director of Tourism Martin Berthod said, “Goody, you should not have had all those gins when you ordered the display”. Fortunately we had sponsorship at today’s equivalent of £220k, and £1.00 bought SFr2.32 as opposed to 1.27 now! After the extraordinary AWSA 50 it was back to Ruhpolding, Germany which hosted the 51st Ex Rucksack (1998). For 19 out of the past 20 years it has continued to do so, and will for at least the next two. The Army first came here in 1979 (2 Div Alpine & Nordic); this was also the year of their first Biathlon World Championships – the range was a little different then! However, in 2008 the Biathlon Junior World Champs were held there and Rucksack had to find a new venue for its biathlon. Although the logistics of having over 200 athletes in a small village for 17 days was daunting, the choice of the small Austrian resort of Obertilliach situated in a remote corner of the Ost-Tirol could not have been better as the welcome we received was anything but remote. And, nowhere more so, than in the Biathlonzentrum where the Race Office was directly connected to Luigi’s Bar! The snow and tracks were second to none. Perhaps this was not surprising given that the layout was planned by the “King of Biathlon”, Ole Einar Bjørndalen. All of Rucksack 2009 was held in “OberT” and another British presence was in January 2015 when Daniel Craig was filming there as James Bond in SPECTRE. It is rumoured that more wine & champagne was consumed at the village premiere than in the World Premiere at the Royal Albert Hall! In 2010 Nordic returned to Ruhpolding and with 3 more World Champs, 3 Junior Worlds and 34 World Cups, it indicates just how fortuitous the AWSA has been to compete in this “Jewel of the Chiemgau” and at the “Wimbledon of Biathlon”. To mark the 10th Anniversary of the ASA, the Patron presented a trophy for the Champion Unit on 29th July 1957. This trophy, “The Princess Marina, Duchess of Kent Cup” (The “Champion Skiing Team” of the British Army) has become one of the most hard fought for sporting trophies in the Army. Affectionately known as “The Marina”, it has been claimed by only 21 different units representing six different Corps. The Royal Artillery has had six different Champions, followed by the Infantry (5) and RLC (4). In various guises 1 Regt RLC have won the Marina 15 times, then 94 Locating Regiment (13) and 35 Engr Regt (12). The current holders 6 Regt RLC are first time Champions! The AWSA has a proud record of representing Great Britain in International sporting events and especially in the Olympic Winter Games. A total of almost 100 Army athletes have participated in all the post war Olympic Winter Games (except in 1952), many of them more than once. At the first ever Winter Games at Chamonix in 1924, the GB 4 man Bob team consisted of one Colonel, two Majors and a Captain; they won the silver medal! BEM, 35 Engr Regt made a record 6th Winter Olympic appearance in the Biathlon at Salt Lake City 2002. Indeed more than half the Army’s post War Olympians have competed in Cross Country, albeit not since 1994. The current eight Disciplines are well attended; some 5,000 officers and soldiers took to the Snow and Ice in the 2016/17 period, bearing testament to the popularity of winter sports. There are currently 5 athletes on the national TASS (Talented Athlete Scholarship Scheme) (two Alpine, two Luge and one Snowboard) for the 17/18 season and two athletes (Cpl Lightfoot (Biathlon) and L/Sgt Deen (Bobsleigh)), who are hopefuls for the PyeongChang 2018 Winter Olympics. Whilst the Army has reduced to circa 80K with some 30K Reserves, the AWSA continues to thrive and is hugely supported by the Chain of Command, none more so than CGS; he states that “Winter Sports contribute directly to military output and fighting spirit, are an essential part of decompression from operations and remain an important element of the moral component”. The AWSA became a Charity in 2012 and is hugely supported by the Army Sports Control Board and sponsors.